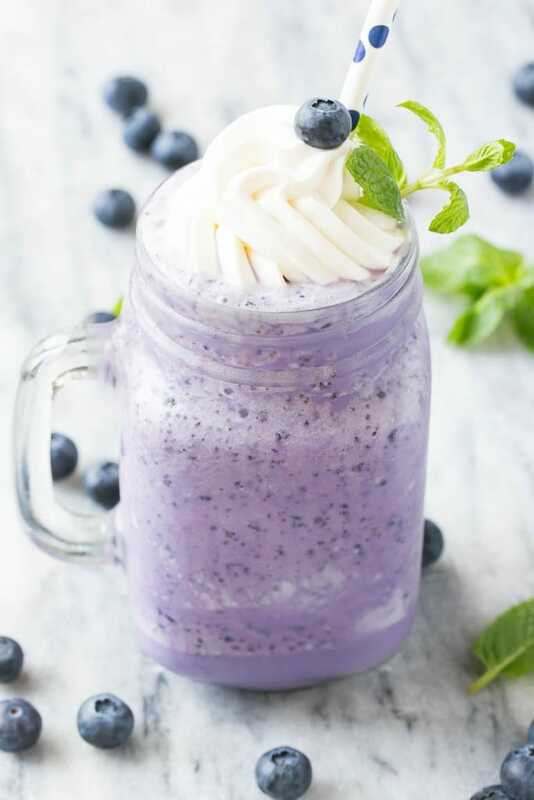 This recipe for a blueberry milkshake is a cool treat that’s on the lighter side – this milkshake has 70% less calories than the original version! Ready for a refreshing drink? 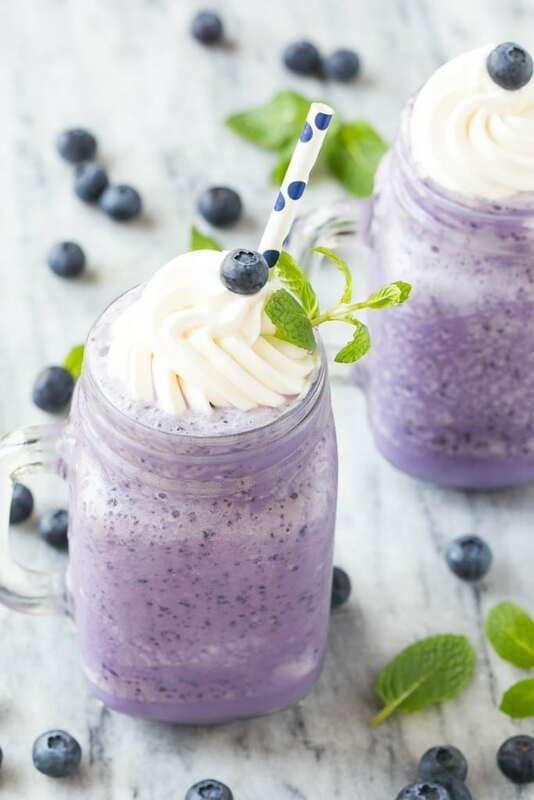 This blueberry milkshake is made with ice cream, milk and frozen blueberries and is perfect for a hot day. What happened to this school year? I feel like it was just yesterday that I was dropping my older girls off for their very first day of preschool and now it’s almost summer break. You know what they say about time flying! Anyways, we all need some cool treats to beat the summer heat and this might be my new favorite. 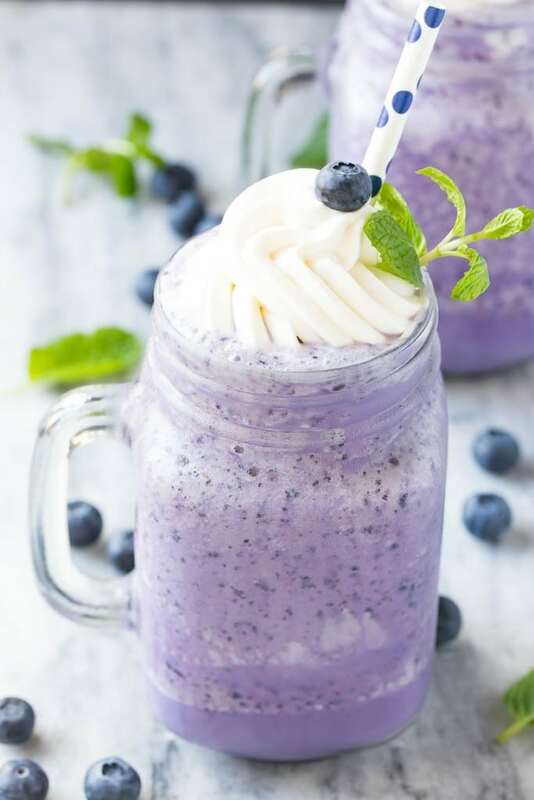 It’s a blueberry milkshake with 70% less calories than the original version. How do you make a blueberry milkshake? Milkshakes taste amazing, but they’re definitely one of the highest calorie frozen treats. A milkshake from an ice cream parlor can set you back over 700 calories and 18 grams of fat with all of the whole milk and premium ice cream. In comparison, this blueberry milkshake clocks in at 220 calories and 5 grams of fat, a huge improvement. So how did I do it? The first step was to cut some calories and fat by using light ice cream and 1% milk. I didn’t use skim milk because it makes the milkshake a little icy. The next step was to swap out some the ice cream for frozen berries – with less ice cream and more fruit the calories drop dramatically. I used blueberries but you could really use any frozen berry you have on hand. A little honey cuts the tartness from the frozen berries because hey, this is still a dessert right? I topped the shakes with some whipped cream, mint and a blueberry. The whipped cream is optional but it only adds a few calories per serving so go ahead and splurge a little. 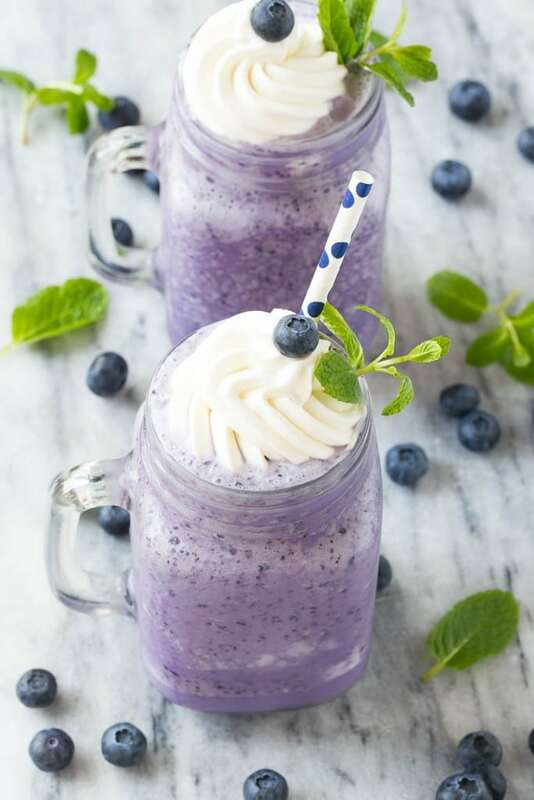 My girls LOVED these blueberry milkshakes and I felt good about giving them a treat that wasn’t loaded with calories and fat. I have a feeling we’ll be making our fair share of milkshakes this summer, and I’m already planning other flavor combinations in my head! 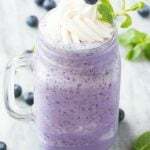 This recipe for a blueberry milkshake is a cool treat that's on the lighter side - this milkshake has 70% less calories than the original version! Adapted from Every Day with Rachael Ray magazine. I love the idea of fresh fruit and light ice cream! What a refreshing treat for hot summer days! We love to make milkshakes for the kids in the afternoon! I am loving the skinny version! I’m jumping back on the healthy eating train, but I still need to satisfy my sweet tooth; this would be the perfect treat for that! I love all of those berries! I LOVEEEE milkshakes but don’t indulge in them very often because they have so much fat and calories! Loving how you lightened these up! Pinned! These look amazing. Shared on my Facebook page and Twitter. I’m going to try these for the kiddos and myself- loving that they are “skinny”!